A Scottish-based team of scientists has created a new method of accurately dating the past. They have developed an approach to the radiocarbon dating process which they say is cheaper, faster and more accessible. Potential applications include conservation, archaeology and forensic science. Every piece of organic material - ourselves included - contains a tiny amount of the radioactive isotope carbon-14. Carbon-14 decays over time - it takes about 5,750 years for half of it to be gone - which means measuring how much is left tells you the age of a sample. It can date materials and artefacts like plants, fossils, bones and soil up to about 50,000 years old. The problem is that existing radiocarbon dating techniques are expensive, energy intensive and use huge arrays of equipment. There are currently only four centres in the UK hosting such a facility. The Scottish Universities Environmental Research Centre (SUERC) is one of them. In a laboratory in East Kilbride they have been dating samples for years using existing technology. The old machine is the size of a couple of buses and creates a 4.5m volt electric field to produce a particle beam travelling at a fifth of the speed of light. It is impressive - but also out of date. Because beside it stands the new PIMS machine. It stands for Positive Ion Mass Spectrometry, a technique which has taken fourteen years to develop. It is the creation of Dr Richard Shanks and Prof Stewart Freeman and their colleagues at SUERC's accelerator mass spectrometry laboratory. PIMS halves the time it takes to date carbon samples by using a far simpler technique than before. It works with samples of carbon dioxide gas rather than solid carbon. That means there is no longer a need for a high energy particle accelerator. Instead a strong plasma generates a beam of charged carbon atoms. A gas collision cell switches the charge from positive to negative and "cleans" the beam to produce enough carbon-14 to measure. The gas that does the trick may raise a few eyebrows. 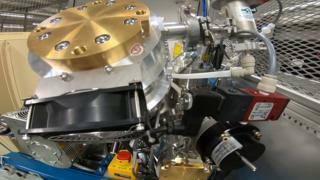 "It turns out that isobutane camping gas can replace particle accelerators in making measurements," says Prof Freeman. "Having realised this we have developed a new instrument technology around putting carbon-14 through camping gas. " Dr Shanks says PIMS will take radiocarbon dating out of specialist centres and "democratise science". "Because this machine is so much simpler than the conventional technology, it takes it away from the national facilities and the expertise that is required," he says. "This machine could go into any laboratory, any department, any company in the world and could be run by just about anybody." It is smaller, faster, cheaper and even more accurate than existing methods. "You're more likely to win the lottery twice than get an interference signal on this system," Dr Shanks says. "This allows us to measure one particle in a thousand million million." A patent pending is on the PIMS system. It was part-funded by the UK's Natural Environment Research Council (NERC) and developed by SUERC, the National Electrostatics Corporation in the US and French company Pantechnik. It will enable researchers to unlock the secrets of Scotland's past and point to our future. Fast and accurate dating will help them track river levels, monitor pollution and assess how our soil is reacting to climate change. The implications for environmental science are global. Because radiocarbon dating can "tell the time" in the carbon cycle it can pinpoint the sources and carbon sinks that contribute to climate change. PIMS is already being used to date sediment samples from the Arctic. One they are looking at during my visit is 27,000 years old and an important marker in establishing how the planet's climate has changed over time. It means this new way of looking at the past has major implications for all our futures.